Here's pics of my first koolaid experience. I dyed 2 skeins of plymouth happy feet sock yarn. I didn't make near the mess that I expected. I'll have to work on that. 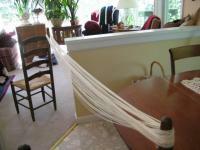 I love your creative way to stretch out your yarn, ladder back chairs are so useful. I applaud your courge to tackle dying. 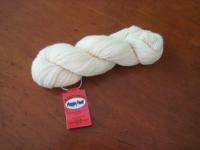 I love the custom aspect of dying my own yarn but haven't got the nerve to try it. Love the colors. You will have to show us the finished product too. It is a drink My flavors were lemonade, strawberry, and berry blue. It took all my will power to not take a gulp out of those cups. (The added vinegar kinda helped there ). I love the colors. Cant wait to see what you make with it. The end product smells pretty good, too. Black cherry is my grandson's favorite color. And I have found that baby oil helps get the color off your hands. Any vegetable oil would probably work, too. Sooooo, what happens when you wash whatever you make, do the colors stay????? What makes it stay on the yarn and not on your hands as you work with it? Very interesting! WOW!!! What a great job you did!!! I love the colors!!! This is all new to me and would love to find out more about how to do it. Do you have a website or instruction sheet you could share? Look foward to seeing what you create from your yarn. Thanks for sharing!!!! Supposedly. Microwaving the yarn is supposed to set the dye. When I rinsed it at the end, I didn't lose any color. (I will wash the socks alone the first time to be sure.). I went to a number of websites and ended up using an article from Crochet magazine as a guide. It's pretty simple and not exact. Here's what I did. 1. Soaked long hank of wool (or any other animal fiber) in warm water and vinegar for 20 minutes. 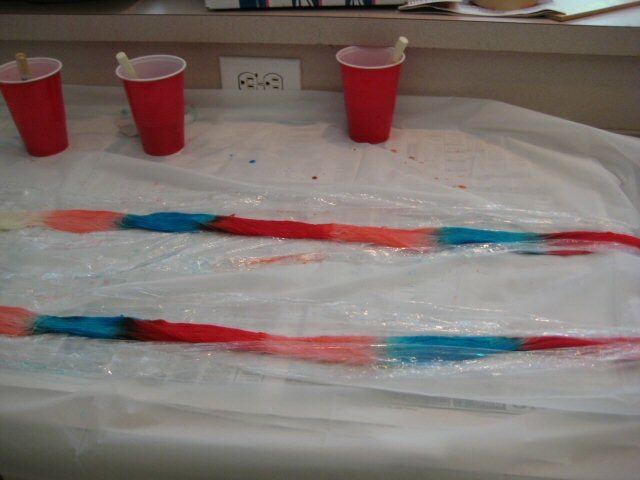 Covered yarn in water add several glugs of white vinegar 4:1 water:yarn. 2. Mixed up koolaid with water & vinegar. 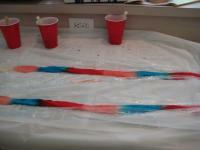 I used 2 packets of koolaid to about a cup of water and a slurp of vinegar. They reccommend 1 packet per oz of yarn. 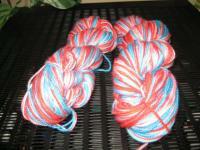 I did about 4 oz (100g) of yarn using a total of 6 packets. 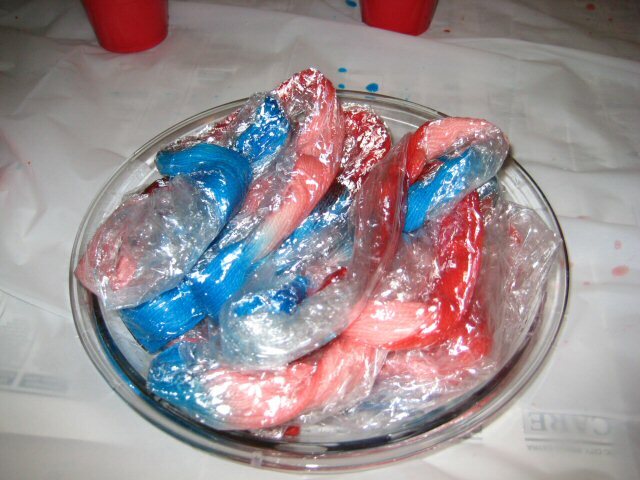 More koolaid=more color. 3. Covered work area with newspaper & drop cloth put on gloves.. laid out yarn ontop of looooooooooooong strip of saran and started putting the dye on the yarn using those cheapo sponge brushes. Mushed dye into yarn making sure to get both sides and all strands. 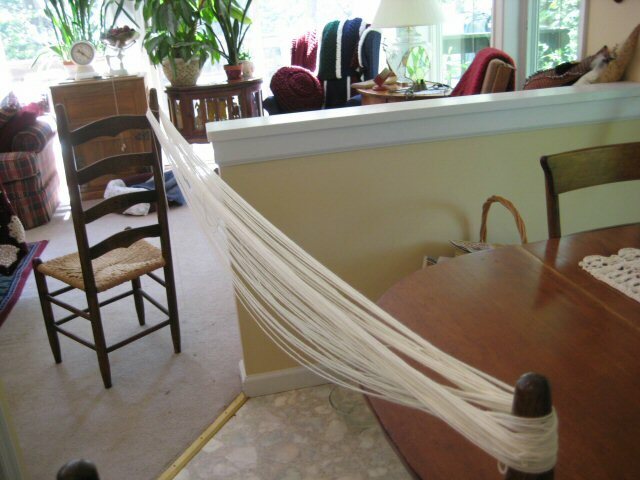 Wrapped yarn in saran to make yarn intestines. Put intestines in dish with small dish of water in center. Nuke 1 minute, rest 2 minutes - 4 times - Total nuke time = 6 minutes. 5. Carefully unwrap yarn and cool to room temp. 6. Swish lightly in soapy water. Rinse. Hang to dry. 7. Once dry, I used the swift to put the hank back to normal size. Now I have no idea how the yarn will work up. Guess I need to get to work on those socks.